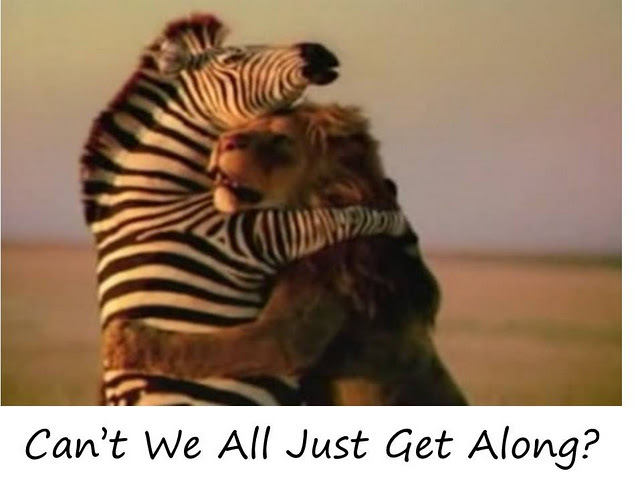 Anytime people work or live in close proximity with one another there is bound to be conflict. It would be nice if we could have a symbiotic connection, knowing that each of us needs what the others have to contribute; however, the reality is that we often find ourselves in situations that are cacophonous rather than harmonious. Most of the time people can work through conflicts. Sometimes, sadly, people find themselves at an impasse because at least one person refuses to compromise and find a solution that benefits all. I am cognizant of the fact that at one time or another that impossible person is me. In those times I’m not open to suggestions or advice because as far as I’m concerned, I’m not at fault. I didn’t do anything wrong. I was falsely accused, and no one understands me. It usually happens when I go into a situation with a preconceived idea of how I want the interaction to go and the solution I want to arrive at, only to be unprepared for differing opinions and feeling like no one is listening to me…rejected. There was also a time when I was confronted with something I did wrong, and instead of taking responsibility and asking for guidance in how I should improve, I became defensive and denied my wrongdoing while knowing full well that I was at fault. Anyone else done that? Sure you have. I found this article on wikiHOW.com entitled How To Deal With Impossible People, and I can’t improve on what was said. So, click the link and read their advice for handling conflict and long-term management of impossible people. I also found a wonderful article on Chabad.org, The Mirror Theory. The Baal Shem Tov (the founder of Hasidic Judiasm) theorized that when confronted by difficult people, the negative emotions we experience are due to the fact that we recognize those unfavorable behaviors in ourselves, and these are opportune times for self reflection and examination. 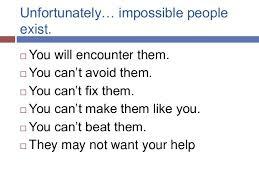 Some basic characteristics of impossible people are arrogance, fault-finding, and being antagonistic. Therefore, I need to cultivate the opposite attributes of humility, being complementary, and kind. Humility is having and demonstrating a modest estimate of ones own importance. It’s not about putting oneself down; it’s simply being honest and recognizing ones own strengths and weaknesses. This works wonderfully with being complementary and recognizing where another’s strength can supply my lack. Finally, to be kind and act in ways that are good and beneficial to others. I find it interesting that C.S. Lewis, in his book The Great Divorce, described hell as people living as far away from each other as possible with no interaction with one another. God’s intention is that we should live together in families and communities. Interestingly, in Israel there was a study that proved that people who lived on kibbutzim (communal settlements) had longer and healthier lives than those who lived in cities. On a kibbutz, everyone owns everything and no one owns anything, and these communities were the backbone to Israel’s early survival and economic productivity.